Finland's contribution to the thrash metal world is undoubtly the band Re-Armed. There has been very much roaring on the program as well as several demo tapes, but finally after 10 years they come with their first full-length album to hammer their name in once and for all. 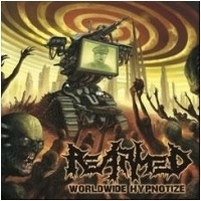 Released via Massacre Records and with 9 songs World Hypnotize marches on to the battlefield where the album cover shows a war situation with a TV screen that could certainly be useful to hypnotize the enemies. Both massive and melodic thrash metal fills the air and Re-Armed should be welcomed by the crowd who loves good thrash metal both live and on CD. Especially the title track Worldwide Hypnotize has good quality, melodic and strong thrash, but the scoop is the last song Trance, which is a slow trance-bringing hypnotic song with storytelling filtered into their personal view of how nowadays thrash metal should be played. In general a fine debut to the Finnish band.